When Mum Leanne, a keen swimmer when she was younger, took Isabelle to her first Water Babies Class at Beechdale Swimming Pool, aged just 8 weeks old, she hoped her little baby would like it. But Isabelle did more than….. she loved it from the start! Isabelle learned really early on to hold her breathe under water and kick back to the side, which are some of the key safety skills taught at the class and by gaining water confidence at such an early age Isabelle was able to swim 5 metres by the age of just 2 years old! 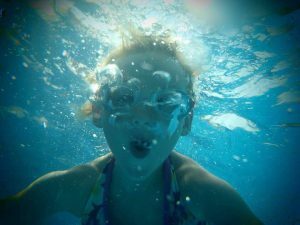 She started Nottingham Swim School lessons in August 2015 and has since gone from strength to strength, building stamina and learning the right techniques. She achieved her 400 metre badge at just 5 and since then has progressed to being able to swim 2200 metres. She can confidently swim butterfly, but Mum says the breaststroke took a little longer to get the timings right, due to the co-ordination needed. 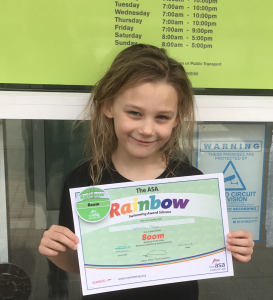 Her favourite part of her lessons are swimming back stroke, diving, practicing race starts and mastering the tumble turn, which has proved invaluable for her Individual Medley Time Trails at Northern Swimming Club, which she joined in January 2017. Along with attending her regular Swim School lesson at Clifton Leisure Centre she also enjoys the Swim School Quackers sessions where she’s learning invaluable lifesaving skills including how to swim fully clothed. Being a member of Northern SC, means she now trains 3 times a week at Harvey Hadden Sports Village which she loves as she enjoys being with the other swimmers, some of who are family too. 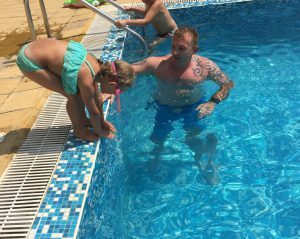 “As parents, it’s important that both our girls are safe around water, especially when we go on holiday, so we can relax a little. She recently took time trails in 100m free style, 50m fly, 100m breaststroke and 100m individual medley and swims with swimmers at the club meets who are much older than her. She thoroughly enjoyed the recent fun gala at Harvey Hadden in March, as she can’t compete in galas at club level until she’s 8, something she can’t wait for. Outside of swimming Isabelle loves singing, dancing and being on stage, but you’ll also find her in the pool having fun with friends, especially as she can SWIM FOR FREE as a Nottingham Swim School member. Being active is important for their health too, they work hard at school and exercising is a great way to wind down. When Isabelle comes out the pool, she’s really happy with herself for what she’s achieved. If you’d like your little one to learn to swim, visit Nottingham Swim School or call us on 0115 8761600 to book a lesson at your nearest leisure centre.